Climbers put up more than a hundred new routes on huge cliffs opened to the public after the purchase of IP timberlands. 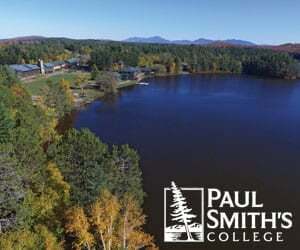 Over the past two decades, the state has purchased conservation easements on some 750,000 acres in the Adirondack Park. These timberlands are protected from development, and many of them are open to the public for recreation. In theory, at least. In reality, most visitors to the Adirondacks seldom, if ever, set foot on easement lands. Partly, that’s because they don’t know where they can go or what they can do. The cliffs on Silver Lake Mountain are an exception. The state purchased easements on the cliffs as part of a massive deal with International Paper in 2004 that preserved some 260,000 acres. Now owned by Lyme Timber, the cliffs were opened to the public—i.e., rock climbers—in 2009. It’d be hard to overstate the importance of the easement deal to the Adirondack climbing community: more than fifteen new cliffs to explore, with the potential for hundreds of routes. In just a few years, a cadre of climbers, mostly locals, has put up more than a hundred first ascents—including one of the hardest in the Northeast. The only climbing areas in the Park with more routes are Poke-o-Moonshine Mountain (with 265) and Crane Mountain (200-plus). Nevertheless, Silver Lake remains something of a secret. For one thing, it does not appear in the current edition of the guidebook Adirondack Rock. For another, the cliffs are a bit hard to get to. The three trailheads are located on back roads north of Wilmington, and the hike in can take anywhere from thirty minutes to two hours, depending on your destination. 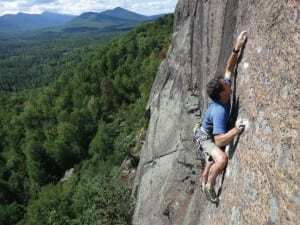 Jim Lawyer, one of the authors of Adirondack Rock, doubts that Silver Lake Mountain will ever attract as many climbers as Poke-o or the crags in Keene Valley. “With the extra drive and hike, it’s difficult to imagine these ever being as popular as, say, the Beer Walls or the Spider’s Web,” he said. For a certain breed of climber, though, the remoteness only adds to the allure. One such climber is Colin Loher, who visits Silver Lake Mountain every chance he gets. Since he lives in Wilmington, just a twenty-minute drive away, he regards these cliffs as his backyard playground. “When people ask me what is my favorite climbing place, I say here,” remarks Loher, who has climbed all over the United States. Last summer, Colin agreed to lead me up one of the easier routes. On the way to the trailhead, we stopped beside a field along Turnpike Road with a grand view of the impressive array of rock faces. Colin pointed out each of the cliffs that have been climbed so far. Some have colorful appellations, such as Never Never Land, Purple Rain Wall, and Hydrogen Wall. Others bear more prosaic names: Mud Pond Cliff, Summit Cliff. “Look at all the rock; it’s really amazing,” Colin said. He believes there is more open rock here than at Poke-o. Because most of it has not been climbed, he and the other craggers who frequent Silver Lake enjoy a sense of discovery as they explore the cliffs and put up new routes. 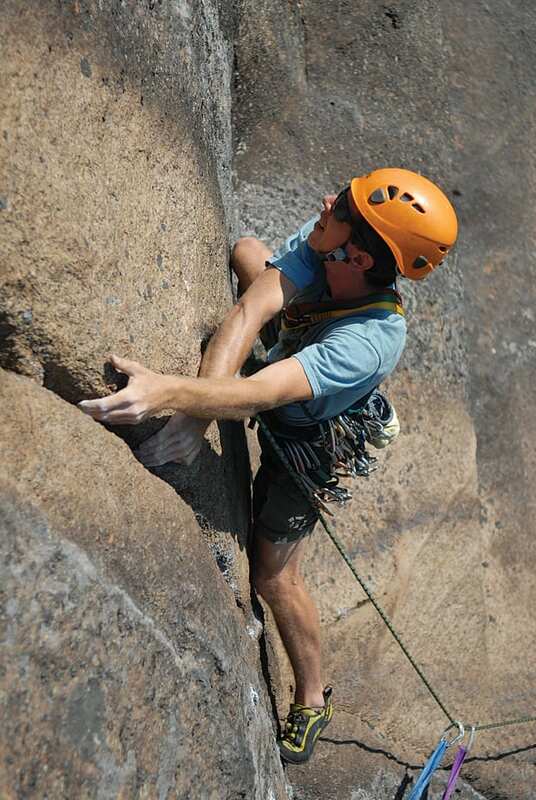 Colin has led numerous first ascents at Silver Lake. On our outing, though, we climbed a line called Stop Making Sense first ascended by Lawyer and Tad Welch. The name, derived from a Talking Heads song, seems apt as the route zigzags crazily up the cliff face. On the hike in, Colin revealed that he got into rock climbing to impress a young woman. Both were students at Northland College in Wisconsin. 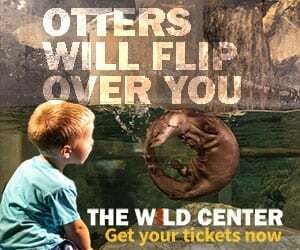 Upon learning that she often hung out at the school’s climbing gym, he started going there as well and eventually took up the sport in earnest. After graduating, with degrees in biology and outdoor education, he found jobs near such iconic climbing locales as Moab in Utah, Joshua Tree in California, and the Shawangunks. As for that young woman, Erica, she and Colin now have two kids, Cecilia, who is seven, and Henry, who is four. She and Colin moved to the Adirondacks in 1999. Since then, Colin has worked a number of jobs to make ends meet: climbing guide, ski patroller, carpenter, Stewart’s clerk—“whatever it takes to sustain my family.” He is now trying his best to keep himself busy as a local guide. Colin also works as part-time climbing instructor at both Plattsburgh State College and St. Lawrence University, two gigs that keep him busy most of the year. Erica is a science teacher in the Westport Central School District. As we wound along the bottom of the cliffs, Colin pointed out a difficult route established by Joe Szot, a local legend who died of a heart attack early last spring, just shy of his fifty-first birthday. (He was stricken while climbing in the Shawangunks.) 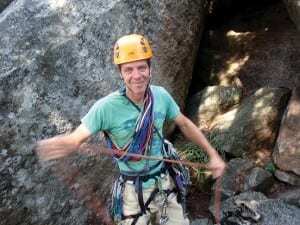 Szot inspired many younger climbers in the Adirondacks with his love of the sport and his larger-than-life personality. Colin deeply respected Szot’s wit, intelligence, and sincerity. As a tribute to Szot, Colin and a crew of friends—including Nick Gully, John Lackey, and Tom Wright—worked for days at another Silver Lake cliff to establish a route commensurate with the hard man’s reputation. After many tries, they got the moves down and named the 180-foot route If You Don’t Like It, Leave—one of Szot’s favorite expressions. It’s rated 5.11b in the Yosemite Decimal System. To give you an idea of its difficulty, the scale once ended at 5.9. Anything above that was considered impossible. A latecomer to climbing, I’m no hard man. Stop Making Sense is rated 5.8, an intermediate route that I expected would be at the upper end of my ability. It meanders 380 feet up the cliff in four pitches, or stages. The climb is unusual in that the hardest part comes at the very beginning. Two blocks of rock lean toward each other and form a sort of cave. You press your feet and hands on opposite sides of the gap and inch upward, a technique known as stemming. You then step onto the right block and work up a short but steep arête, or sharp edge, to easier terrain. After watching Colin, I was able to stem and reach the base of the arête without trouble. Here I hesitated, not finding handholds. Colin instructed me to place my hands over the arête and lean back. This move, known as a lieback, shifted weight onto my feet. With the sticky soles of my climbing shoes pressing into the rock, I shuffled up the arête and then scrambled up to Colin, who had tethered himself to a big oak while belaying me. The next pitch is much easier (rated 5.4). Again, Colin went first, with me paying out rope as he ascended. We climbed a jagged edge of rock, traversed left to a large crack, and ascended the crack by applying the lieback technique again. The crack led to a wide ledge, which we followed to the start of the third pitch. By now we were a good ways up Potter Mountain, with expansive views of the Lyme timberlands below and countless peaks in the distance, Whiteface and Catamount being among the more conspicuous. As far as we could tell, we were the only ones on the cliffs this day, adding to our sense of remoteness. Our sense of exposure—the feeling of having nothing under your feet—also was about to intensify. The crux of the third pitch is rated 5.7+, meaning it’s nearly as difficult as the arête at the start of the route. Except now we were more than a hundred feet up. Colin crossed a sloping ledge and came to the hard part: a nearly vertical section with tiny holds for toes and fingertips. It requires a delicate touch and a good eye. For my benefit, Colin marked a few key holds with daubs of climber’s chalk as he went up. Still psyched by my success on the arête, I got through the crux easily and then climbed over low-angled rock to rejoin Colin at the base of a long, low wall. For the final pitch, rated 5.7, we surmounted the wall, traversed right on a steeply sloping ramp, stepped around a corner, and ascended the last fifteen feet relying on the friction of our soles. The pitch went off without a hitch until the last part, where the grade steepens. Again, Colin placed a few daubs of chalk to mark the way. He intended them to mark handholds, but I thought they were footholds. So I ended up in the wrong place and slipped. Since Colin had me on a tight belay, there was no danger, but to get this far and blow it was disappointing. Colin insisted I had stopped myself, without the rope’s help, but I think he was just being kind.